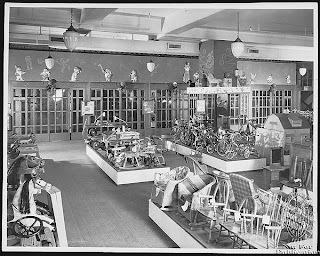 I have been thinking about the old department stores of Baltimore lately. Thinking about the departments and their services. My memories of the wig department and the tables with oval revolving table mirrors at each wig station, the rug section that we use to run in and out of the hanging rugs, the fabric department with the cool device that counted the yardage as the sales woman pulled the edge of the fabric through, the Santa Clause that came out of the huge chimney that was on top of the Hutzler building at Westview in December that is part of Laura Lippman’s novel "What the Dead Know". 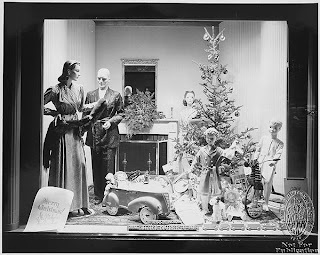 ..and those windows, those magnificent window displays, especially at Christmas. 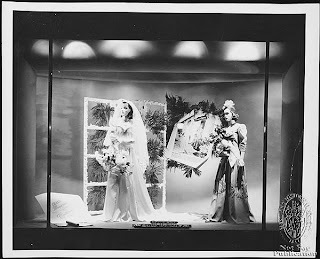 We would get all dressed up to go Christmas shopping on Howard Street and look at the Christmas window displays. Easter, we would go to Hutzlers for the children’s’ Easter Breakfast…which usually entailed an Easter Bunny and some sort of puppet show that would scare the hell out of me. I scared easily of such things. ..clowns and puppets…Anyway, I found this site that has tons of photos of very old Baltimore…I found these of the window displays at Hutzlers a bit before my time, but I thought them pertinent to post. These photos are so great! 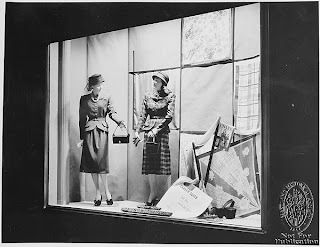 They reminded me of when I was talking to the carpenter at IKEA who started out working on window displays in Pennsylvania as a young man. He told me about one that featured a live baby elephant from the local zoo that came with a caretaker during the duration of the display. The windows actually were on an elevator system and the elephant got on at a lower level and then rode the elevator up to street level! Can you imagine?